In late June 1940 Britain stood alone against Germany, and there was much talk of invasion. While hurried plans were made to defend against such a move, Churchill asked for plans to be drawn up to take the fight to the enemy in occupied Europe, and as a result the first Commando unit was created. They acted as raiders until 1943, when they were made into assault infantry and took on a more conventional role. 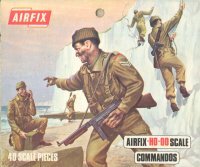 Like many other sets, Airfix decided that their original figures were not of a good standard and retooled them. The figures on this page are known as the first type, with the replacement figures being termed the second type (reviewed here). However for reasons unknown the second type set did not last very long, and production reverted to the first type, which is the type still being made today. The poses in this set are quite a departure from the normal World War II selection. Some thought has gone into the nature of the Commandos activities, and a number of poses reflect this well. The man advancing with a knife is a good example, as is the man with a detonator. The man with the grappling hook and rope is another raider type of pose, though it is unclear why he is holding this as he is. The man with the anti-tank gun is a little out-of-place as this was a bulky weapon to take on a raid. The two men in the canoe are quite fun however, and the two men carrying something over their head could be holding either a ladder or the canoe. Initially the Commandos were dressed as per the regiment each man had come from, but as they gained experience they adapted their dress and kit to suit their task. Most noticeably they often abandoned their steel helmets in favour of the 'cap,comforter' which was to become their trademark and which every man here is wearing. Consequently these are definitely meant to depict the men in their earlier raiding days rather than the later assault infantry role. Other than the cap the uniform was standard British infantry issue, but with kit stripped to the minimum to allow rapid movement. Indeed kit has been stripped rather too far for our liking, as the men carry nothing more than small ammunition pouches, which do nothing to represent the standard pouches of most Commandos. Completely missing is any sign of sidearms, ropes, packs or the various kinds of knives that so many carried. While most of these things are not obligatory they should have been represented here, and at least a few with the standard inflatable life-belt would have improved things too. While these are light raiders they would still require much of the usual kit which is absent here. Automatic weapons and grenades were favoured weapons, and the men also carried a variety of knives and other weapons as they wished. However these figures are very poorly detailed, so weapons are impossible to identify. In some places there is no engraving on the surface at all, and while not as poor as some of the earlier Airfix sets they are well below the standards of today. Some examples also suffer from problems with the flow of plastic so extremities such as weapons are not properly formed, and ironically many also suffer from a good deal of flash. Some of the poses have not been realised particularly well, and the lack of detail certainly makes them appear quite toy-like compared to the competition from other manufacturers. It seems like a good move to have them retooled, and the second type are certainly far superior, so it is a great pity that the second type did not last long, and the majority of the figures in circulation are of the inferior first type.